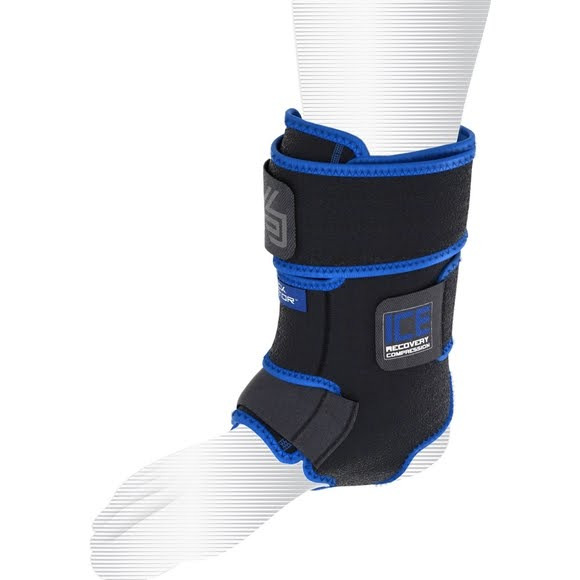 The Shock Doctor ICE Recovery Compression Ankle Wrap is revolutionary icing therapy for injured, sprained or sore ankles. Ice like a pro with a wrap that fully surrounds the joint, while being easy to use and less messy. The penetrating therapy helps reduce swelling and pain by extracting heat through gentle compression and deep 360 degree coverage. The Shock Doctor ICE Recovery Compression Ankle Wrap is revolutionary icing therapy for injured, sprained or sore ankles. Ice like a pro with a wrap that fully surrounds the joint, while being easy to use and less messy. The penetrating therapy helps reduce swelling and pain by extracting heat through gentle compression and deep 360 degree coverage. This cools the ankle faster and helps speed the body&apos;s natural ability to heal. The Gel Packs can also be used heated if desired.